The dense fibre pack spread the weight and therefore further reduces the incidence or severity of pressure sores. The natural fleece fibres of the wool absorb perspiration keeping the skin dry, helping to prevent the incidence or severity of pressure sores. The dense fibre pack spread the weight and therefore further reduces the incidence or severity of pressure sores. The polyester fleece fibres allow moisture to pass through, keeping the skin dry, helping to prevent the incidence or severity of pressure sores. The dense fibre pack spread the weight and therefore further reduces the incidence or severity of pressure sores. Available in a range of sizes for different situations. Pure Wool Double Bed Fleece 54" x 60" (1372 x 1524mm). 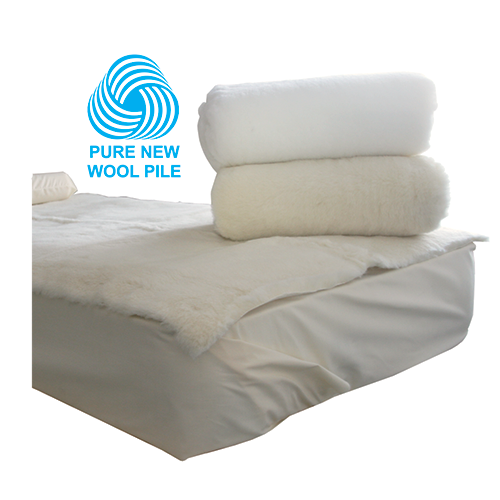 Pure Wool Std Single Bed Fleece 36" x 60" (914 x 1524mm). Pure Wool Narrow Single Bed Fleece 27" x 60" (686 x 1524mm). Pure Wool Hip/Shoulder Pad Fleece 27" x 30" (686 x 762mm). Pure Wool Heel/Ankle Pad Fleece 15" x 30" (381 x 762mm). Polyester Double Bed Fleece 54" x 60" (1372 x 1524mm). Polyester Std Single Bed Fleece 36" x 60" (914 x 1524mm). Polyester Narrow Single Bed Fleece 27" x 60" (686 x 1524mm). Polyester Hip/Shoulder Pad Fleece 27" x 30" (686 x 762mm). Polyester Heel/Ankle Pad Fleece 15" x 30" (381 x 762mm).